Here at the shop we have been working on windows for the historic Winthrop and Gore Hall buildings of Harvard University. There are over 1,000 windows which we are restoring or replacing outright. One of the more interesting windows is this high arched window shown in the first image. There are numerous windows of this design. 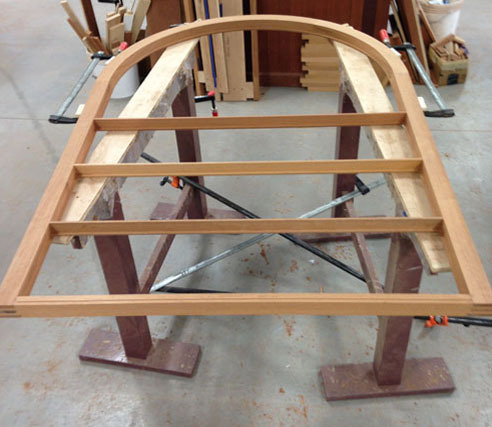 Here we have the sash glued up and some cross muntins being installed by our assembly department. In the second photo all the muntins are installed and the top portion follows the arch design to create an eye catching pattern from which the sun light will come through the glass. The wood species chosen for this job is FSC (Forest Stewardship Council) certified South American mahogany. FSC certified means that the wood was harvested within the specific guidelines formulated by the Forest Stewardship Council. For more information go to their website. As well as keeping up with the large output of windows for Harvard we have also the capacity to keep up with our other clients. A residential project has a need for our double hung windows – shown in image 3. Here is one of our employees squaring up a sash and gluing the tenon joints up just right. There are also sliding doors to be manufactured and image 4 shows veneers being glued onto the door cores. This process guarantees limited warping over great lengths and sturdy strong sliding doors which makes them function seamlessly. This is just a little sneak peek at what we do here at Hirschmann and hopefully you come back to check out this blog for more exciting projects. We will be showcasing a window from start to finish here on this blog to show the quality of materials, amount of skill, expertise and dedication it takes to build a custom design Hirschmann window. Thanks for your time!